We've given up on it folks! Archaeologist are sometimes accused of making up stories but yesterday afternoon and today makes weather forecasting more of a fairy tale than archaeology. 09:00. Its a beautiful morning with a bit of a breeze. It looks to be set fair for the day. There is an air of well-being - even a "feel-good-factor" - in Trench AX (extension to Trench A) this morning and it emanates from Liz. She is smiling and singing strange ditties with the occasional "Red Army" or chorus of "Singing in the Rain" easily distiguished amongst the general chat. Occasionally she becomes Bob Dillon and there's an outburst of "The times they are a-changing". Her normal red hat has been replaced by a peaked hat and she's wearing a red & white striped shirt. 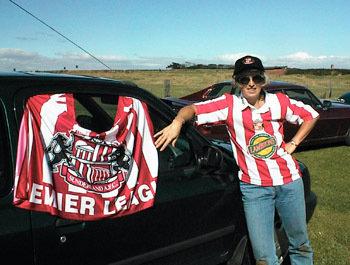 Over towards Seaham Hall a car is parked which is also decked out with a red & White banner extolling the virtues of Lizs favourite football team. "Record it, Ed, so that I can remember the date we beat the Mags at St James' Park", she shouts. She is referring of course to the fact that last night Sunderland beat Newcastle 2-1 in a Premiership match at St James Park in torrential rain. The picture below says it all. Poor Jamie, a Mag fanatic, had quietly disappeared from the scene to avoid Liz's gloating. 0915. Liz has settled down a bit now and is hard at work digging in the extension trench. Jim points out that when the new metal object was removed it could be seen that it closely resembles one of those previously removed closeby. though nothing matching object A has yet been found. 10:00. 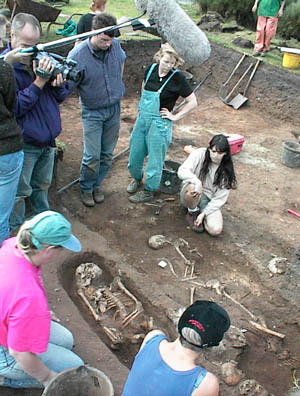 The Dig'99 team are well at work as the BBC TV team arrive. Only two, mind, which probably indicates that the BBC are trying to give us value for the extra £24 a year we will be paying for TV licences. Still it's not the fault of the "Meet the Ancestors" team, Bill Locke (Producer) and Lydia Wilson. 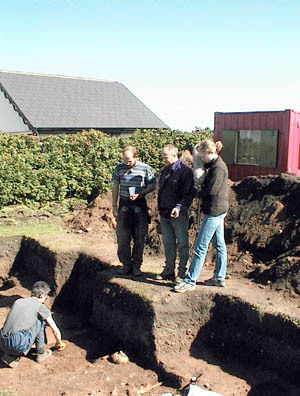 Lydia is a researcher and proved it by finding the way to Dig'99 from East Anglia where they had been filming previously. They spend some time with Naill and Jim who explain what the site is all about and by 10:30 are taking shots for their archives. "Meet the Ancestors". Bill Locke (camera) and Lydia Wilson (sound) recording on-site. There was plenty for Bill Locke to see on his visit to the site. We hope he picked up the very careful way in which these earliest Harbour Lads and/or Lasses are treated by the diggers. There is, of course the "need to know" factor but it is also important that these individuals in their final resting places are treated with respect. 15:30 The team have worked extremely hard and there are a plethera of skeletons now exposed. Clearly, there have been individuals buried on top of others. 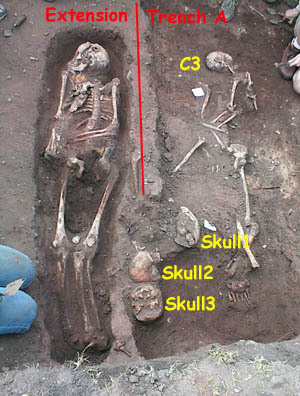 Some skulls seemed to be separate from any related body. There are a whole range of questions to be asked about the skeletons . However there has been a find which may prove to be even more interesting. Along the edge of one grave in Trench A, mixed with skeleton C5, two nails have been found. 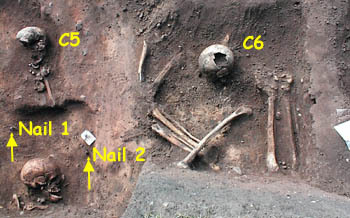 The nails have a square (pyramidal) head and might indicate that at some point this skeleton was buried in a box with a nailed-down top. This is the first indication of a coffin of any kind. All other burials appear to have been in a shroud. We will try to bring you a better view of the nails tomorrow if they have not been shipped off site. It is, however, possible that they were taken away since work continued until 20:00 tonight. The site is littered with skeletons after todays work and it has become difficult to place them on a Trench Map. We will examine our video record to assist in this and attempt to add an updated Trench Map for Trench A and its extension. For now her are a couple of picture to give you are impression of where everything is located. There are skeletons everywhere. 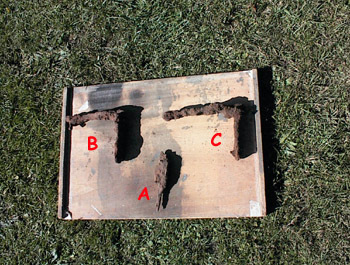 All those shown are align W-E spread along the east walls of Trenches A and AX. Trench AX looking towards the south. 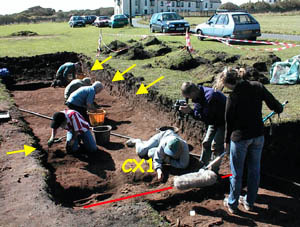 The arrows indicate roughly where skeletons have been exposed. The Team are now running out of time to lift all the skeletons which have been exposed. At some point tomorrow a halt will be called and the JCB will be brought in to re-instate the field into its original condition. The team had a Dig'99 Dinner (Two for the Price One) at the Phoenix tonight. Nobody ordered the Spare Ribs. 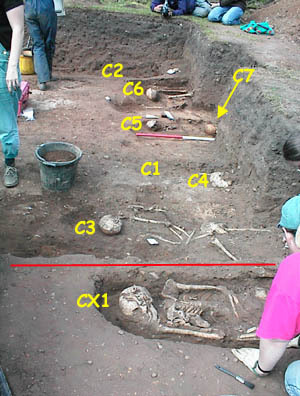 As mentioned earlier many of the Team worked until 20:00 hours to remove skeletons. The dedication to the task has been most impressive throughout but particularly today.